They can be either your customers or your own organization. If your organization is divided in multiple entities, you can add a company for each branch. If your organization is divided in multiple companies. The Main company is one of them, and is used to find: tasks, absences, billing rates common to all companies if needed. It is described below with more details. If your organization has a single company it is the Main Company and there is nothing special about it. 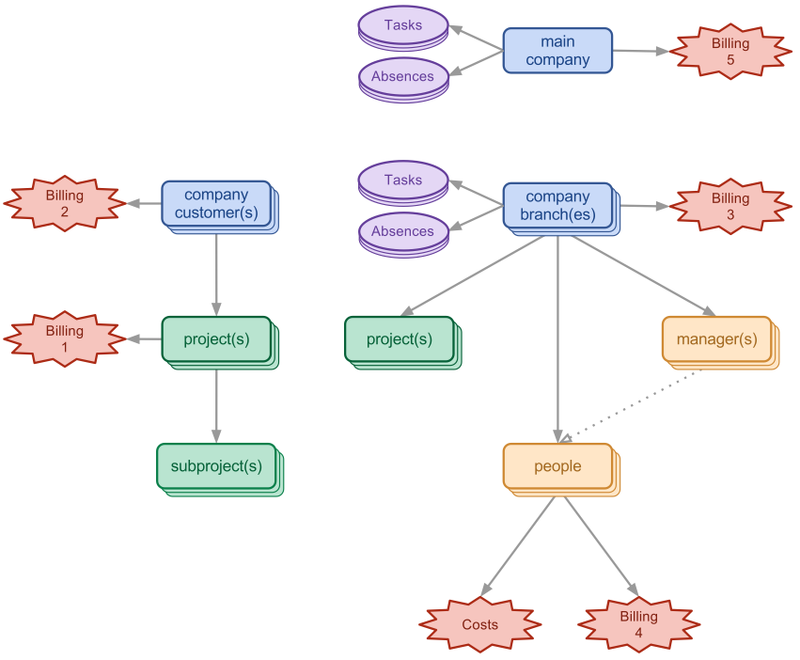 You can divide the work you do for your customers in projects with Projects. You can set internal projects to a company of your organization as well. You can divide a project in smaller parts using Subprojects. This will impact what these manager can see in Approval and their Reports or Charts. Active people can fill a timesheet and are part of the counter for the subscription. People can have a Standard cost you can use to evaluate your profitability. The first billing rate found is applied to the hours.